Pour all the contents of the cake mix in a bowl along with the eggs, water, and oil. Then pour in an entire 1 oz. bottle of red food coloring to get you that gorgeous deep red for the cake! Mix it well. Pour the batter into a greased 9x13 baking pan. Bake in the oven for 30-35 minutes or until a toothpick inserted in the middle comes out clean. You’ll want to cool your cake until it comes to room temperature. In the meantime, we can make the whipped cream! Pour about 1 cup of heavy whipping cream in the bowl of a stand mixer. Whip it up on high speed for about 3-5 minutes. Whip it until it’s fluffy and firm at the same time. Once your cake has cooled, flip it over onto a cutting board. Then take a serrated knife and slice the cake long ways every 1 to 1 1/2 inch or so. Then slice it the other way to get cubes! Now you’re ready to pipe the whipped cream. Take a spatula and a sandwich bag and put the whipped cream in the sandwich bag. Then cut the corner tip of the sandwich bag. Not too big of a hole! Then start piping the stripes on the cake squares! You should end up with flag stripes. Be sure to add a little bit extra whipped cream to where the stars will be. Then add the blueberries to where the stars will be and voila! 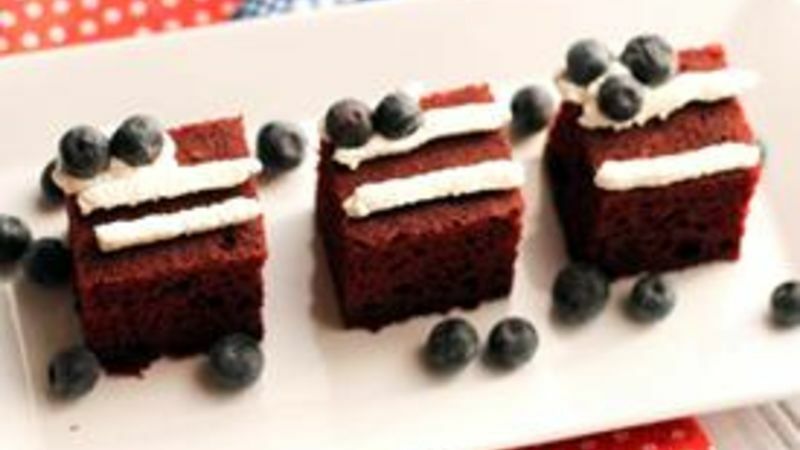 Beautiful and cute mini flag cakes! Fourth of July is this Wednesday and I know you have some fun plans with friends and family! Am I right?! I look forward to the Fourth of July every year because there are a bunch of creative party dishes that I’m always dying to try. The colors red, white, and blue just go so well together and they’re so versatile in dishes! Finger foods are always popular when going to a friend’s house to cook-out or even if you’re having people over. Who doesn’t love miniaturized snacks? I know I’m all about them! These cute little Mini Flag Cakes are something you should DEFINITELY think about bringing to a party or having at your party. They’re so easy to make and they take virtually no time to prep once the cake part of it is out of the oven and cooled. Let’s start by pouring all the contents of the Betty Crocker German Chocolate Cake Mix into a bowl along with the eggs, cocoa powder, water, and oil. Then pour in an entire 1 oz. bottle of red food coloring to get that gorgeous deep red for the cake! Now, let’s mix it all up! Then pour the batter into a greased 9x13 baking pan. In the meantime, let’s make the whipped cream! Pour about 1 cup of heavy whipping cream in the bowl of a stand mixer. Whip until it’s fluffy and firm at the same time. Once your cake has cooled, flip it over onto a cutting board. Then take a serrated knife and slice the cake long ways every 1 to 1 ½ inch or so. You’ll get something that looks like this! Now you’re ready to pipe the whipped cream. Take a spatula and a sandwich bag and put the whipped cream in the sandwich bag. Cut the corner tip of the sandwich bag. Not too big of a hole! Start piping the stripes on the cake squares! You should end up with something like this. Add a little bit of extra whipped cream to where the stars will be. Repeat until all your squares are done! Aren’t these adorable?! I absolutely love them and they’re SO delicious and too easy to eat up! I hope your party guests, or your party host and friends, LOVE them and gush about them!